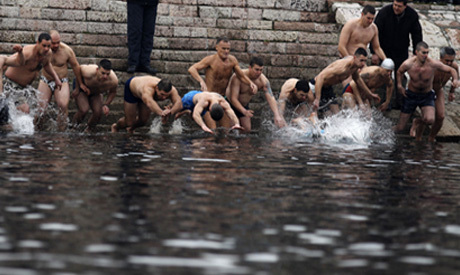 Russians have celebrated the Orthodox Christian holiday of Epiphany by dipping themselves into below zero freezing waters. Epiphany is a Christian festival that celebrates the baptism of Jesus. It begins on 18 January and runs through 19 January. Moscow Today showed videos of devout Christian believers immersing themselves thrice into watery potholes in the ground after making the sign of the cross. In Russia's far east, temperatures plunged to a freezing – 45 celsius. In Moscow alone, 90,000 people took the dip. According to the weather channel, the temperature fell to 5 celsius in the capital. Egypt's Coptic Orthodox church of Egypt also celebrates the holiday.